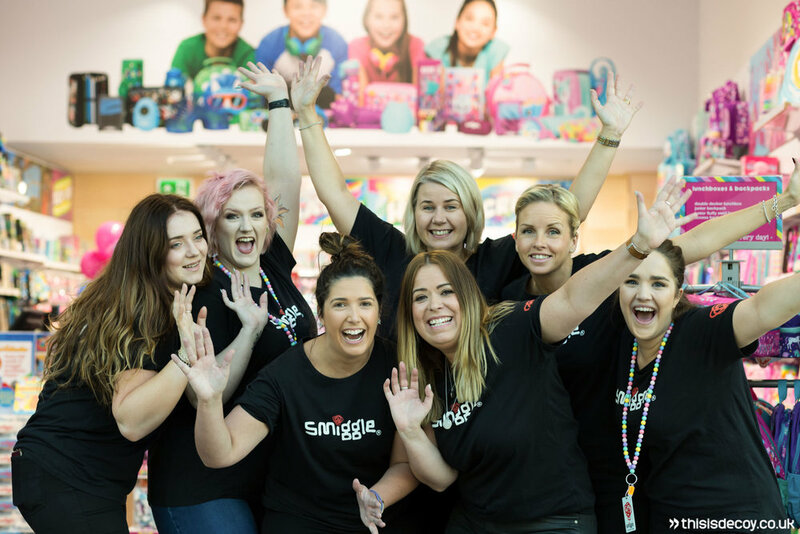 When Smiggle got in touch about being their PR photographers in Manchester for their new store launch in the Trafford Centre, we were more than happy to get involved. We have never before and since come across such a hectic shop to photograph in. The amount of products, patterns and colours rammed into this reasonably sized unit was insane! Thereâ€™s a very slim chance any kid that walks in here is leaving without at least one item. The brief was to capture the store empty, the happy team and customers in and enjoying the experience once open. Delivery was required same day so that these images could be sent to press including the Manchester Evening News, who sent a reporter to cover the event. We grabbed lots of close ups of the various ranges and individual items whilst the staff were making the finishing touches and cleared the store for around 5 minutes before opening time to shoot some wide angle images demonstrating the size of the store, the signage and the breadth of the stock options. We then moved onto capturing the happy smiling team members outside the front of the shop. The best thing about being a Trafford Centre photographer is being covered from the Manchester rain but still getting loads of natural light in from the glass roof. We got the staff all shouting and jumping to create some great images for press use. 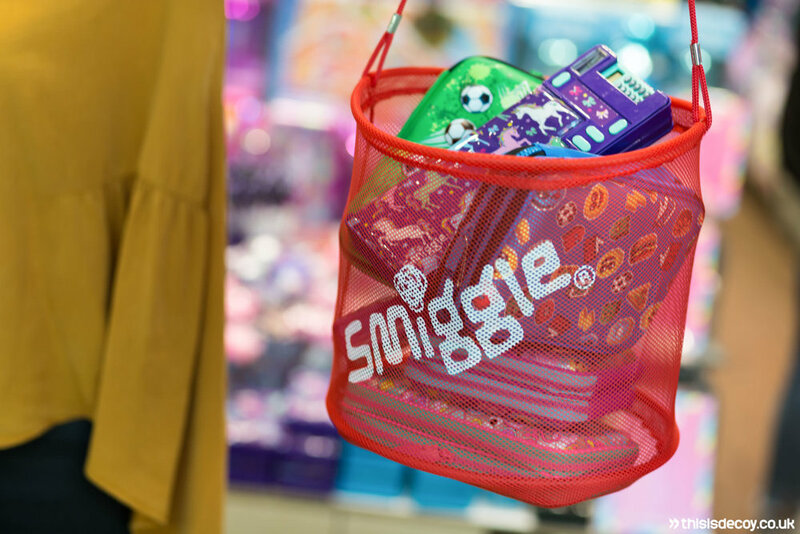 At 10am the Trafford Centre and the new Smiggle store opened and customers were in straight away to get their faces painted and play various games competing for vouchers in-store. A mix of ages all featuring happy faces were required and this was shot mainly in a natural candid style. We took a few posed groups of customers or families too for variety. The event was a great success in launching the new branch for the international kids retail brand. Our images were used both externally for press and social media content as well as internally. Thanks so much we absolutely love these photos! They are just what we were after! Our brand manager & Marketing manager in Aus loved them too! Very well done on these! Itâ€™s great to get super positive feedback like this as it means were doing something right! Below is a small sample of the 140 images we delivered to our client within hours of the shoot. If you require a photographer for a PR opportunity in Manchester please donâ€™t hesitate to get in touch! We supply corporate photographers in Manchester to all sorts of clients. We work with our client Castle Fine Art all over the North West and the UK. On this occasion, we were booked locally to capture an artist appearance by Raphael Mazzucco. He along with a huge display of his fantastic pieces took over their King Street gallery near Deansgate one sunny evening in July. Raphaelâ€™s career started and grew to enourmous heights as a fashion photographer. Creating content for the likes of Vogue, Marie Claire and Vanity Fair. In recent years he has turned his skill set to the world of fine art. His style blends the mediums of paint, photography and hand lettered text, using stunning backdrops. His experience as a professional photographer along with unique techniques come together to create truly fantastic work. His sought after work and international recognition is something to aspire to as a professional business photographer specialising in commercial photography. Initially, we captured some images of the property. Showing off the exterior and interior of the building in a commercial photography style. This included some interesting detail shots of the exhibition specific branding and stylised light fixtures in the venue. The gallery and their PR agency required some portraits of Raphael and the light outside was perfect for this. Placing our subject in some scattered light coming through the trees supplied us with some incredible light to work with. Using a shallow depth of field and the window displays as a backdrop helped us to create a moody and striking set of corporate portraits. We find a key element in providing solid business photography is coverage. Itâ€™s for this reason we capture as many aspects of a project or moments of a corporate event as possible. This means we are more likely to satisfy our clientâ€™s needs for the perfect set of images to tell their story with. Wide lenses are of course used for lots of the photos we create but in this setting, a lot of the images (that can be seen below) were shot on a telephoto lens. The compression is flattering when photographing people, it enables us to easily blur out the background using a fast aperture and also â€˜shoot throughâ€™ different objects in the location. This is to create interesting foreground elements and helps to provide clean areas for designers to add text to our images in magazines or on websites. We really enjoyed working within a Castle Fine Art gallery space once again. We were really happy to see some of our images included in our clientâ€™s printed industry magazine and featured on their website. As a team of Manchester based photographers, we are able to take on both small and larger projects. The advantage of using a company over a freelance photographer in Manchester is that we all work as a team to get results for our clients. Our styles match up both in the shoot and the edit and there is always someone on hand to step in should there be a problem with the photographer that is booked in for your project. If you need to hire a photographer in Manchester or require a portrait photographer in Manchester - weâ€™re here to help. Do you need to find a Manchester event photographer, corporate photography or a commercial photographer for any project in the North West and beyond? Get in touch today to find out corporate photography prices, and for a no-obligation quote. If you are looking for a professional photographer in Manchester, look no further. We are a small team of experienced and friendly creatives that love delivering great results that keep our clients coming back. One of these clients is Castle Galleries, which on this occasion we had the pleasure of capturing their involvement in the King Street Festival on a sunny day in June. The artist being featured at the exhibition was none other than Alex Echo. 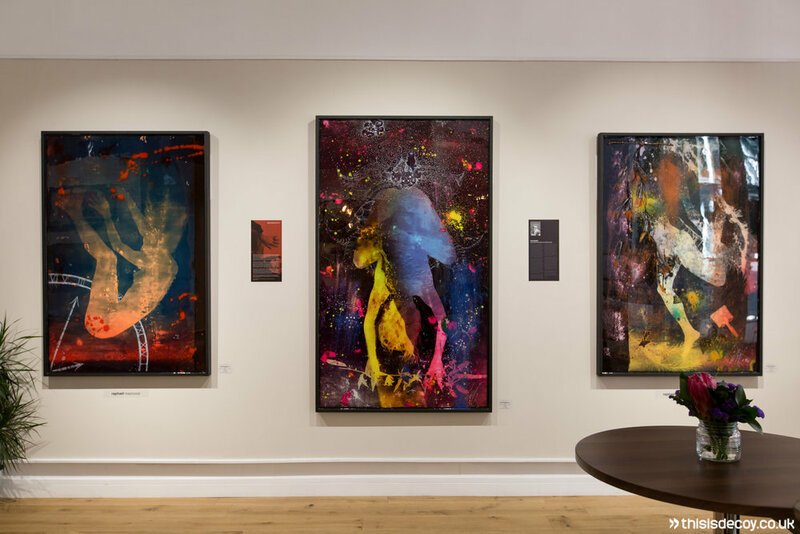 He produces fantastically colourful and vibrant pieces that worked perfectly both in gallery and outdoors on Manchesterâ€™s most iconic and historic street. The festival features talks and tastings, alfresco dining, live music, pop-up bars, lawn games and much more. Being based just around the corner, Arcane were serving some delicious looking colourful, themed cocktails. Being a freelance photographer in Manchester certainly has some perks! Towards the end of the shoot we managed to steal Alex for a few minutes to ensure we had some portrait photography options for our client. The amazing setting lined up perfectly with a little cloud cover, giving us some beautiful diffused light to work with. We also love the image of the saturated window display and bright blue sky. It was the perfect hero image to hand to our client and present the set of photos with a great introductory cover image. Presentation is everything and we deliver all of our images by a secure online gallery where images can be downloaded in varying sizes, shared or printed via a studio quality printing lab. We loved being involved with King Street Festival via the gallery event and hope to be back there again this summer! Do you require food photography, a food photographer UK, festival photographer or a team of professional photographers to capture your festival or event? Please get in touch for a free, no obligation quote. Weâ€™re happy to talk to new clients about Manchester photography prices.